Multi Eisner and Harvey Award nominee Ted McKeever is one of a select few comic artists whose talents, though perfectly suited for the sequential art form, are evocative enough of the “fine art” world to guarantee that he could find success and acclaim there as well. 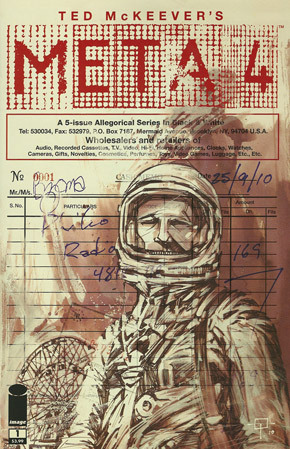 He, along with contemporaries like Kent Williams, George Pratt, Bill Sienkiewicz and John J. Muth have the creative flexibility and artistic chops to produce works for multiple outlets of the larger art world. As such, their comic work, particularly titles which are entirely conceived and created by themselves, can be very few and far in-between. This is why McKeever’s new series from Image and Shadowline Comics, Meta 4, arrives as such a welcome treat for comic art devotees. McKeever is well known for his early, self-created titles like Transit, Eddy Current, Plastic Forks, Metropol, and its sequel Metropol A.D. His highly distinctive style was cemented from the very beginning: his sketchy lines and often heavy inking applied to angular, expressionistic characters and decaying urban landscapes suggest everything from steampunk to future-noir, but still exist entirely as McKeever’s own. These titles can be hard to find complete on their own, but thankfully have been reprinted recently in a series of collections from Image titled The Ted Mckeever Library. The often lengthy time between these more personal projects have give the opportunity for McKeever to illustrate the writings of others, and it has always been interesting to see him give his take on familiar characters such as Batman and Superman. Even though these stories reside in the world of superheroes, they also exist very much in the realm of German Expressionism, making McKeever the perfect artist to illustrate them.In 1995 McKeever wrote and illustrated his very singular take on the Batman mythos in the pages of Legends of the Dark Knight #74 & 75. The best title which McKeever drew, but did not write, was the acclaimed 1993 Vertigo mini-seres The Extremist, penned by Peter Milligan. Now, ten years since the last McKeever written and illustrated mini-series (Vertigo’s Faith) we have the release of the first issue of Meta 4, and all the mysterious and enigmatic qualities of his best work is very evident here as well. Meta 4 opens with the coming to of an amnesiac astronaut on the surface of the moon. As he struggles to piece his thoughts together he (and the reader) realize that he is not on the moon at all, but instead a beach which leads to the (nearly) abandoned boardwalk of Coney Island. It is in these opening pages on the boardwalk that we see a new side to McKeever’s art. In previous work, his backgrounds are often dominated by thickly lined and densely inked urban blight, blanketed by dark, oppressive, heavy clouds that look solid enough to fall right out of the sky. In Meta 4, McKeever favors a very intensely fine-lined approach to the exterior environments that are still very ominous and mysterious, but suggest more of a nod to classic illustration techniques than expressionistic broad-strokes. In exploring the area, our still unnamed astronaut has a brief encounter with a Santa costume wearing stranger whose dialog is expressed in the form of familiar icons and symbols. This is interesting because, although we all recognize the images, without their intent expressed verbally it is hard to say if this character is a threat or not to our protagonist. In other words, an image without context doesn’t carry meaning. The indecipherability of the iconography coupled with the ambiguity of the malicious or friendly intent of the Santa is worsened as the astronaut himself cannot hear anything outside of his helmet. McKeever sometimes will interrupt inner dialog and the search for meaning with slashes of violence and Meta 4 #1 is no exception. An attempt to help an injured woman hiding in a restroom leads to an encounter with her acquaintance which leaves our main character very much worse for wear.At this point our stranger in the Santa costume intervenes and things really begin to get nasty. The often complex work of Ted McKeever’s makes it difficult to give a worthy appraisal of Meta 4 vol. 1 as there are still 4 more issues to go, but this is one creator that has never let me down before with the sheer originality of his concepts, and razor sharp artistic execution found in his books. I urge all thinking (and adventurous) comic fans to pick up Meta 4 as well as the three volumes of The Ted McKeever library. Perhaps dwelling in these darkest of places can lead to enlightenment at the end of one long, intensely detailed tunnel.